In the past I have done so much work on the theory of the different energy systems and now I have a blinding example to make it seem much more relevant to the the real work runner – not the gym goer doing a bit of a run off the treadmill. cultural nuance’s in the phrase – anyway back to the science. When you run significantly faster than your sustainable “aerobic” speed (with oxygen) your body has a really cool way of operating without oxygen. So for a very short time you are invincible and super quick but there is a terrible backlash in terms of the waste products and the recovery time. This “turbo energy store” is designed for the flight or fight reaction – to get you out of trouble – to stop you from being eaten by a sabre toothed tiger. (A logic driven observation was that ) you just need to avoid being the slowest in the herd or group, being the front runner is of no benefit and the tiger can only catch and eat one item or prey at a time! Anyway the reason for saying all this (and its a guess) – I will wait for comments from the more medically trained readers – a person’s anaerobic capability will not be greatly inhibited by restricted lung efficiency BUT recovery will be slower and less efficient. 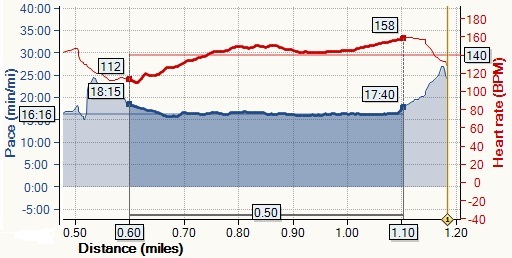 So though sprinting feels great the boomerang effect of the recovery means that “going anaerobic” during a timed event needs to be avoided at all costs, unless the finish line is comfortably within range, because the time and effort involved in resetting the anaerobic “turbo charge capability” far exceeds the benefits of the very short boost to your performance. Being doubled up gasping for breath is not a good look until you have reached the finish line. In sports science terms there are actully 2 anerobic systems BUT one is OK (in trained altletes) for 100m the other for 400m. Geek warning – unless you have an interest in this or like to know all the details don’t click on the wikipedia link with getting a headache tablet ready and being prepared to ask how did I get the this page and the next and the next. ATP-CP system (Phosphogen system) -The ATP-CP system neither uses oxygen nor produces lactic acid if oxygen is unavailable and is thus said to be alactic anaerobic. This is the primary system behind very short, powerful movements like a golf swing, a 100 m sprint or powerlifting. Anaerobic system – Predominates in supplying energy for exercises lasting less than 2 minutes. This assumes that the sabre toothed tiger problem reported in some of the more rural parkrun sites has been contained BUT for an overtaking manoeuvre or a crowded start a little burst of speed can be useful but be aware of what will happen if you use up all of this “booster pack” and create a big surplus of lactate or deficit of oxygen. The concentration of blood lactate will not increase until the rate of lactate production exceeds the rate of lactate removal. And or 8 minutes in the minimum “ralking” duration again for endurance. So we know that 90 minutes running and walking is possible. We know that 5 miles can be covered walking and running. We know that creating a good range of heart rate is possible. The 2 “afterwork” sessions are compared. For “maximum” efficient use of time the first component will be endurance. So for the time being the goal is to run 5k and enjoy it! This is the most important component on the exercise session. 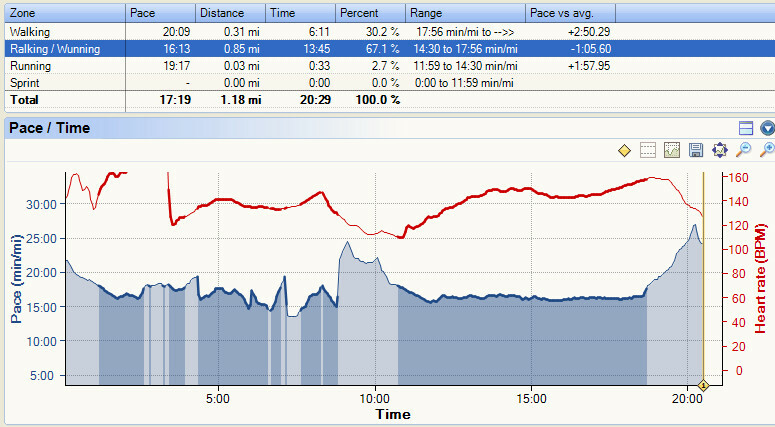 So we can see in the green graph above the heart rate increases gradually until the distance of 0.6 miles has been completed. That day it was an approximately rectangular course – the nearer the course is to a rectangle and without being too extreme and slowing should have square corners – round them all off equally. Then if the maximum distance equates to 2.5 laps next time try for 3. In addition after several minutes rest if required the same distance should be attempted. In the second session the overload (which = adaptation) will take place. The first session has value in terms of calories expended and being therapeutic etc but its real purpose is to allow the second work interval session to be carried out. Hence the second session may feel harder and need more focus. For a bit of fun the fast running – preferably up a hill can be done. 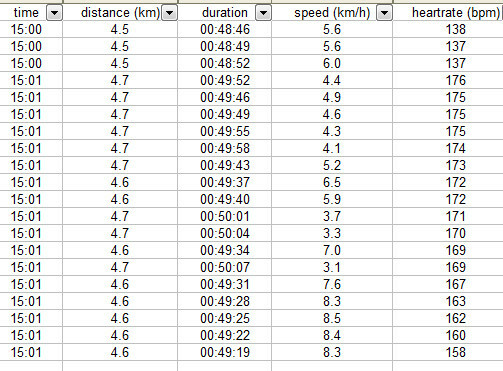 The aim of this is max heart rate as quickly as possible – very few repeats are fine – even one peak to exceed the max during the endurance session is fine – several are better. This HIIT creates the afterburn where calories are burnt for many hours. This component is needed as eventually running a steady 5k gently will not raise the heart rate enough! All feel free to comment! 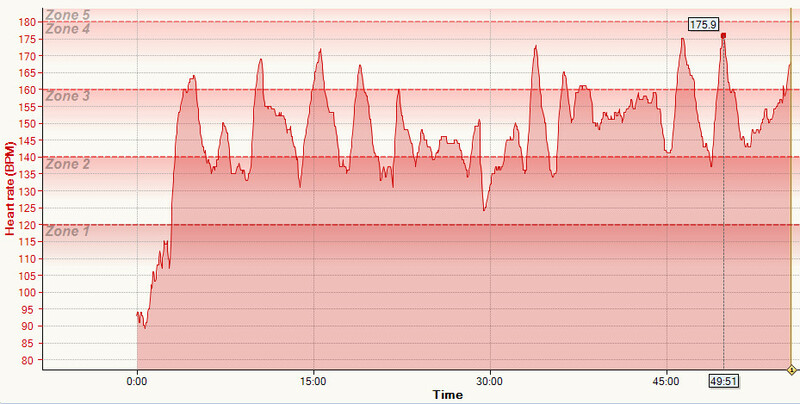 – If you are not training with a heart rate monitor consider the benefits and efficiency with your work out time.